I wasn't even going to mention St. Patrick's Day, but what the hell... Let's have a contest and giveaway to celebrate! You guys know Zane Lamprey from Drinking Made Easy? 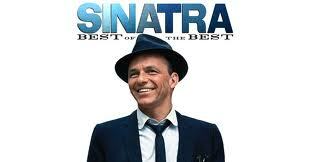 Apparently, Zane teamed up with EMI Music and their release of Sinatra: Best of the Best. They had a contest where entrants invented a drink that connected with one of the songs on the album. The winner has been selected and will appear with Zane on the Drinking Made Easy episode airing April 17 at 8pm on HDnet. Pretty cool prize right? Well, the winner of my little contest gets nothing like that. But winning a Zane Lamprey prize pack and the Sinatra Best of the Best Album is still pretty awesome, especially considering how easy I'm going to make it to enter. You can enter up to 23 times, but only once per song. Each entry must be left as a post comment. If you type it on Twitter, it doesn't count. If you write a long paragraph, I might not read it and it could potentially disqualify you. If you use poor grammar, it's a strike but not necessarily a DQ. Have your entries in by 10 pm Eastern on Sunday 3/25/12. I will pick a winner shortly afterward. Thought it made sense. Wish I could drink PtY and listen to Sinatra every day. It is very smooth, just like Ol' Blue Eyes. They just go together. Island Summer Ale is easy going like a summer breeze. Sometimes bloody can be funny. For instance, take the film 'Shaun of the Dead'. A hilarious zombie flick best enjoyed after downing a few My Bloody Valentine's at The Winchester! The Lady is a Tramp with Clown Shoes Tramp Stamp because its well, the two names pretty much say it all. A tramp by any name or type is still a tramp!! Fly Me to the Moon: 15 years ago, strong beers on tap were rare, but Khyber always had Heavyweight available including the delicious Lunacy. It would fly you to the moon if you're not careful, and it has "Luna" in the name to boot. The reason I chose this is because I completely agree with the statement and I think the song is perfect for Dogfish. As for not picking a beer and instead picking a brewery... As the wise monk told Eddie Murphy in the Golden Child while he was trying to finish the impossible obstacle course and get the knife, "You must know when to break the rules." Now if we can only convince Sam and The Pain Relievaz to cover My Way, that would be awesome! Ken. One more test. I need your address (and name if you're using some alias) to give to EMI so they can send you the album and prize pack.